A 60 y o female with altered consciousness accompanying with a file of previous hospital admission and lab reports mentioning abnormal levels of Na and K.
On Admission MRI T2w images show T2 hyperintensity confined to centre of Pons. No abnormal restricted diffusion on Dw images. MR Angiogram of Brain show no significant major vessel stenosis or occlusion. 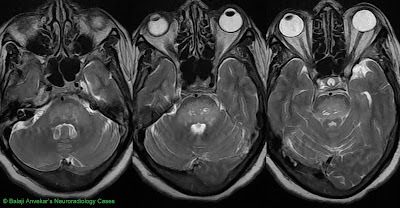 Imaging diagnosis: Central Pontine Myelinolysis (CPM) / Osmotic Demyelination. Foci of Gliosis in Pons. No abnormal enhancement on post contrast T1 supports clinical and imaging diagnosis of CPM. Syn : Osmotic Demyelination Syndrome, ODMS. An acute demyelination caused by rapid shift in serum osmolarity. Classic setting is rapid correction of hyponatremia. ODMS may occur in Normonatremic patients (Reports with normal Na+ levels are known). CT; may be normal. May show faint hypodensity confined to center of Pons. Non enhancing on post contrast. 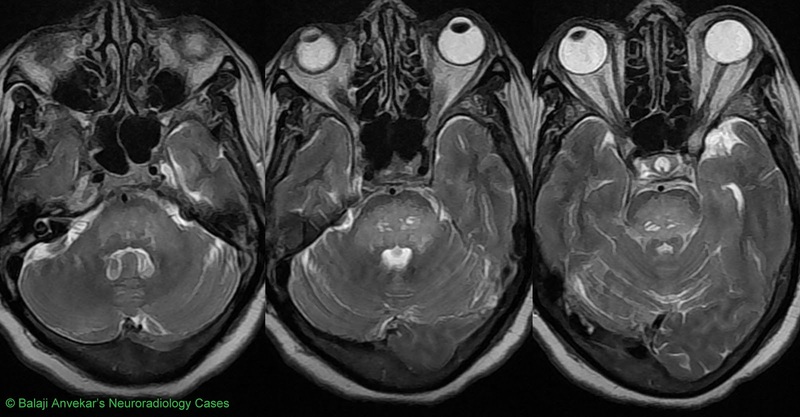 MRI; T2 hyperintensity confined to center of Pons seen in ~50% of cases. Diffusion may be normal or may show faint high signal. May involve basal ganglia and cerebral white matter without Pontine involvement is called Extra Pontine Myelinolysis. Pontine and Extra Pontine involvement together is pathognomic for ODMS. Infarct: Usually off midline and unilateral as commonly occur due to occlusion of perforators arising from basilar. May affect centre of Pons and extending to periphery if there is complete basilar occlusion, restricted diffusion on Dw images, an associated basilar occlusion on MR Angio. Neoplasm: Imaging Pontine Glioma may confuse with CPM. Clinically CPM has acute debilating course. Pontine Glioma pt will be young, clinically stable with slow progressive symptoms, without any history of hospital admission or osmotic corrections. Follow up can help, if lesion increases in size goes in favour of Glioma.